There are some seriously lovely layers to this bread. The soft outer crust is naturally bright orange, while the creamy caraway seed speckled inside calls for you to take a giant bite out of it. I was so thrilled with the success of the sprouted bread I made a couple of weeks ago that I decided to keep experimenting; this time I tried baking bread with sprouted red lentils. Now I can’t tell which one I like more, this simple sprouted red lentil bread, or the sprouted green lentil bread that inspired it. While the green lentil bread has a deep, earthy flavour with an added sweetness thanks to the raisins, there is something addictive about this red lentil one. Both breads are very filling, and therefore provide lots of bang for your gluten free buck! If you’re an impatient baker like me, you’ll appreciate that the sprouted red lentil bread is much faster to soak, sprout and bake than the green one. Sprouted breads combine so many of the things I love: cooking gluten free on a budget; growing healthy sprouts; eating sustainably; and eating good tasty food. 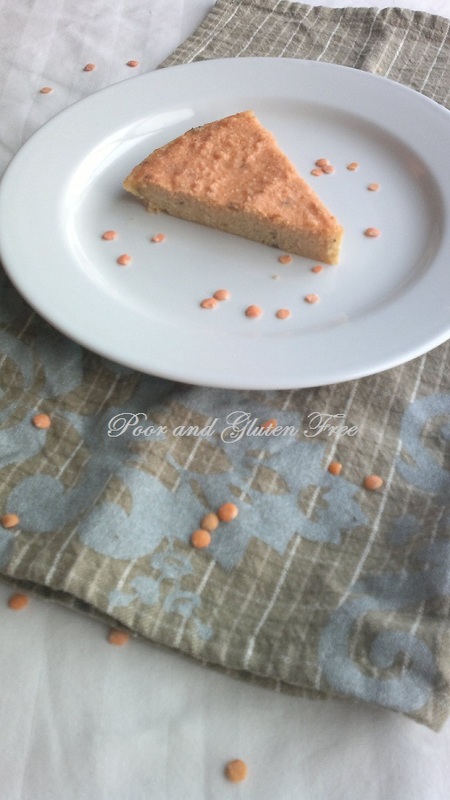 Lentils are so good for you that you can eat this gluten free Essene bread guilt free. Lentils are high in fibre, but super low in calories and have no fat. They have been shown to help balance blood sugar levels and are high in iron = perfect for diabetics and ladies who are lacking in iron now and then. With their high protein and iron content, lentils are also a vegetarian’s best friend. So last week I started sprouting red lentils to try to create a similar version of my gluten free Essenebread of the previous week. At the same time I was still enthusiastic about using my new coffee grinder to make flour and wondered if I couldn’t do something with lentil flour. I came across this red lentil flour bread recipe from natural noshing that helped form the base of this sprouted red lentil bread. I’m really pleased with the results of this bread. If you don’t have caraway seeds on hand, you could use dried rosemary, onion flakes, or other seasonings instead. Next week I’ll share another sprouted bread I’ve concocted – sprouted chickpea bread – so be sure to check back! 1. Grease a round pie plate with oil (your choice, canola, olive, coconut, etc) You could also use a baking sheet, oiled and covered in parchment paper, or a square baking pan. 2. Grind the sprouted lentils, either in a coffee grinder or food processor. I actually just use my coffee grinder, it works better than my food processor. See here for using a coffee grinder for grinding flour. I do the sprouted lentils first as they are stickier, than the dry, as the dry will absorb the mashed leftovers and make it easier to clean the grinder after! 3. Grind the 2/3 c dry lentils, also in grinder of choice. See here for more details. 4. Add water, salt and caraway seeds to ground lentils and combine. This will be a spreadable paste. 6. Pour paste into plate or pan and let rest 5-10 minutes while oven heats up. 7. Bake about 15 minutes. If using a baking sheet, this may cook faster as it will be thinner. *OAS Info: Lentils are a common OAS food. The sprouting and baking process *should* destroy the allergen proteins and make this safer for OAS folks to eat. If in doubt, check with your doctor. Looks good! I'm going to have to try this one. Thanks for stopping by, Rogene :) I've just picked up some red lentils today so I can make myself another loaf too! Thank you for this recipe! My son has allergies to gluten, eggs and dairy, so I am always on the look out for these types of recipes. I made this last night. This was the first time I tried making flour in a coffee grinder and I ran into a problem. After mixing all the ingredients together, the dough was pretty watery. The only thing I could think of was that I didn't grind the peas fine enough. So I ended up making more lentil flour and adding it. I also added a touch of agave nectar because the dough tasted slightly bitter. (My son is 8 so he would notice this). Anyway, I tried it this morning with my breakfast (boiled egg and a cut up tomato). 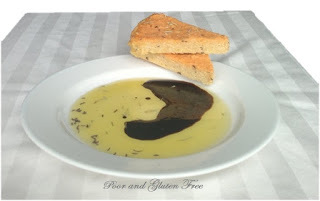 I loved it with the olive oil and balsamic vinegar. I feel like you have created a really nice recipe. I am thinking about add ins too like roasted garlic! I soak all of my lentils for digestion so I wonder what it would like if I soak all of them? What happens if you don't grind them and just mash them? Hi Anna, I'm not sure what would happen if you soaked all of the lentils, but I think it would make for a very different texture. 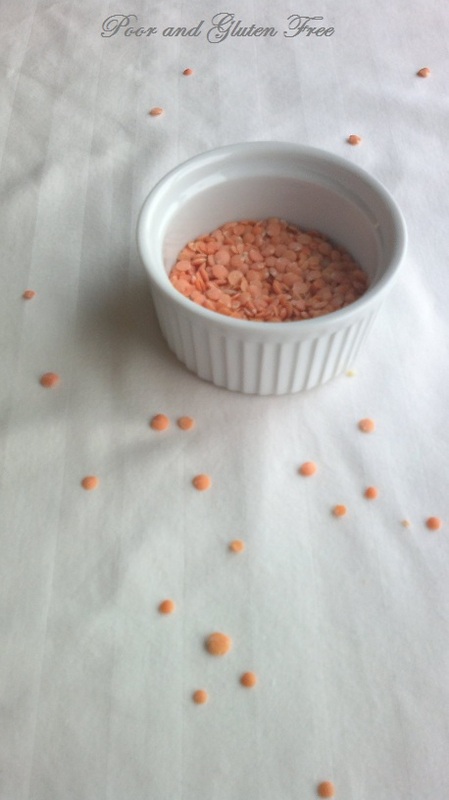 Red lentils get so mushy that without the flour to absorb some of the moisture it might not bake properly. You could potentially try it using a different type of flour, rather than ground lentils, if you're concerned about digestion. Maybe some rice flour, or even a sprouted grain flour?